Former Liverpool and Bournemouth midfielder Jimmy Case says the Premier League side are "there for the taking" before Wednesday's League Cup quarter-final between the two at Dean Court. 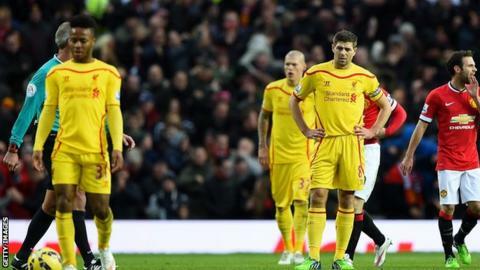 Liverpool were beaten 3-0 by Manchester United on Sunday in the same week they exited the Champions League. The Cherries, meanwhile, are currently top of the Championship. "If I was a Bournemouth fan I would be rubbing my hands," Case told BBC Radio Solent's Sportshour show. "Liverpool are there for the taking. I watch Liverpool every game. The lack of confidence within the side, the work ethic, there is a lot of work to do to get them back on track." Liverpool have achieved their lowest points total after 16 league games under the three points for a win system since 1964-65. Brendan Rodgers' side beat Bournemouth 2-0 in the FA Cup in January, despite an impressive display by the second-tier side. Case feels a repeat of that performance would see the Cherries emerge victorious. "They all want to play Liverpool at the moment," he said. "I would fear for the Liverpool fans as Bournemouth are doing very well. "Bournemouth manager Eddie Howe has done a terrific job and it's going to be one hell of a tie. "The team is a shadow of its former self from the one that won down there in January. If Bournemouth play like they did in January they will probably win this tie." The Reds sold Luis Suarez to Barcelona in the summer, while striker Daniel Sturridge has missed most of the season through injury. Case feels that inconsistent team selection has a part to play in their slump. "Rodgers has to get a team out there that can gel together," he said. "Whoever he has put out in recent months, there has not been a top-level performance. "There has been a revolving door in terms of team selection. They play one week, they are out the next. "They would love to still be in the Champions League and from Liverpool's point of view staying in competitions is vital. "It will be difficult because now they have dropped down into the Europa League, the programme in terms of fixtures also becomes [tougher]. "I'm sure he [Rodgers] will go with a strong outfit."